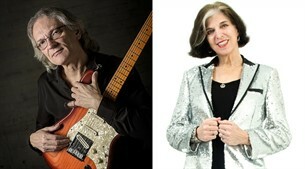 With Marcia Ball's rollicking Texas boogies and groove-laden Gulf Coast blues and Sonny Landreth's electric bottleneck lightning, this show is sure to keep you swinging! Both highly acclaimed blues musicians, Ball and Landreth have enjoyed careers spanning decades, with each recording over a dozen albums. “Fifty years have passed in a flash,” says Texas-born, Louisiana-raised pianist, songwriter and vocalist Marcia Ball of her long and storied career. Ball, the 2018 Texas State Musician Of The Year, has won worldwide fame and countless fans for her ability to ignite a full-scale roadhouse rhythm and blues party every time she takes the stage. Her rollicking Texas boogies, swampy New Orleans ballads and groove-laden Gulf Coast blues have made her a one-of-a-kind favorite with music lovers all over the world. With each new release, her reputation as a profoundly soulful singer, a boundlessly talented pianist and a courageous, inventive songwriter continues to grow. Virtuoso slide guitarist and bandleader Sonny Landreth has a career spanning decades building over a dozen acclaimed albums. His latest, ‘Recorded Live in Lafayette’ is a 16 song opus that covers more musical ground than any single album ever could, as the singer and songwriter’s work stretches and twists across 93 minutes of full band acoustic and electric bottleneck lightning. Landreth has collaborated with the very top names in guitar over the years: Eric Clapton, Mark Knopfler, Eric Johnson, Derek Trucks – the list goes on. The noted slideman cut his musical teeth in The Red Hot Louisiana Band of zydeco king Clifton Chenier, and Landreth has since recorded and toured with artists ranging from John Mayall to John Hiatt.